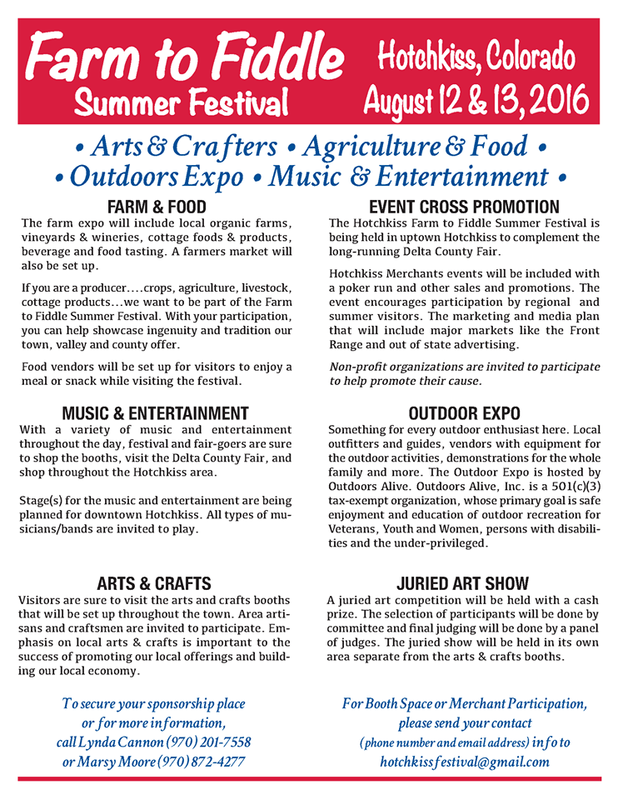 It is our pleasure to invite you to the 2016 Farm To Fiddle Festival, taking place in Hotchkiss on August 12 and 13. The event will be held in downtown Hotchkiss concurrent with the Delta County Fair to complement the events at the Fair and to attract a wider audience for both events. At the Festival you will find Arts & Crafts vendors. Farm & Food booths and vendors to include local organic farms, vineyards and wineries, beverage and food tasting. Music & Entertainment is being planned for downtown and all types of musicians/bands are invited to come and play. Outdoor Expo for every outdoor enthusiast is being hosted by Outdoors Alive. Juried Art Show competition will be held.